“A dinky sequencer to accompany the Wasp or Gnat synthesizer and indeed with other analog synths. This comes from a smoke free studio which has been barely used and was last serviced in Sept’18 by SRS. Tested and in good working condition prior to listing. 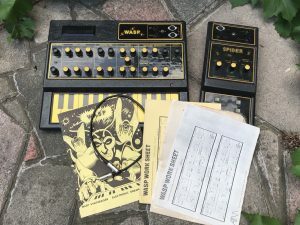 “Here is a rare EDP Wasp synth & EDP Spider Sequencer with interface link cable. The Wasp is a two oscillator synth with a quirky touch sensitive keyboard and an onboard speaker. The Spider is a simple step sequencer. Both are in great working condition although with all these old units there is cosmetic damage. Cosmetically: Amazing ! almost as new. I doubt you could ever find an EDP Spider in better condition than this. Definitely suit collector. Very rare synthesizer sequencer. No cracks in case which is very unusual ! ” You are bidding on a vintage Electronic Dream Plant Spider sequencer and OEM connect cable. This particular EDP Spider was recently inspected and serviced, and is in perfect working condition. The Spider sequencer records notes input into it from another EDP synthesizer, and allows quantization, as well as the ability to sync to an external source (like a drum machine), and send cv and gate out. It’s fast and easy to use, and the results are mind boggling! Cable to connect to your wasp or gnat is also included. Great little synth with a unique sound. “Selling this EDP Spider sequencer for EDP Wasp synthesizer. This Spider needs fix but has the potential to join your EDP Wasp.. Currently i am short of time to repair this unit. To my opinion item looks good, no extreme damages or any other funny stuff. Comes with original connection cable to connect it to the wasp.” Auction ended. Click here to browse on eBay. Verkaufe für einen Freund, den WASP & SPIDER. Sie stammen aus erster Hand ! Der Wasp gibt Töne von sich, jedoch scheinen nicht alleFunktionen gegeben zu sein. Schaltpläne gibt es Netz. Der Spider Sequencer funktioniert scheinbar nicht ( Oder keine Kenntnis ). Original Verbindungskabel ist dabei. Optisch sehr gut erhalten ( nichts abgebrochen) , dem Spider fehlt eine Kappe. siehe Originalbilder. Daher ausdrücklich an fachkundige Experten & Bastler.” Auction ended. Click here to browse on eBay. “Vintage rare EDP Wasp and EDP Spider (both working) with manuals and cable. These item are fully working and have been recently repaired and serviced by James Walker synth repair services in Stoke on Trent. The EDP Wasp synth has been fully cleaned and serviced (no scratchy pots) and the keyboard is in a beautifull clean condition with no fading. There are two cosmetic chips on the back corners as visible in the photographs and do not effect the sound. Also the battery cover is missing. apart from this it is a fully working, a beautifull example of an EDP Wasp. The EDP Spider is a sequencer for the Wasp, it is incredibly rare. It has been checked and is fully working, serviced and cleaned. ” Auction ended. Click here to browse on eBay. the Wasp does partly work – see below. I bought these 2 units and cable second hand in the mid 1980’s from an NME journalist. They had a reasonable amount of use for about 7 years (used with a Boss DR55 that connected to the Spider -see my other auction) and since then have been boxed in storage inside my flat. Never gigged, home use only. There are no cracks or broken casing on either unit just some light marks and scratches. However, the ‘ENVELOPE GENERATORS’ Sections do not affect the frequency/sound of the note. If I touch any note on the keyboard it does not respond. I have tried adjusting the white keyboard touch sensitivity screw (just above keyboard) and this has no effect. Does not make any sound from internal speaker, just a hum. Please Note: The second photo shows 4 controls have been replaced. Typically 4 of the yellow tops went missing and I replaced these with new knob/tops from Clocktronics. The original 4 Wasp knobs with no yellow tops are part of the sale . In the past this used to work when connected to the Wasp and using a Boss DR55 I could stop/start a sequence by connecting to the ‘Sync In’. Now – Even after connecting the LinkCable I do not know if the Spider works because of the problem with the Wasp – see above. ” Auction ended. Click here to browse on eBay. “This is a now rare vintage EDP WASP synthesiser and matching Spider Sequencer.The WASP is fully working , all the controls function and this is in great condition for a WASP of this age.Unlike many WASPs , this one’s touch sensitive keyboard is not worn out , and works perfectly.The sound from this small synthesiser is fantastic – big moog-like basses , and because of its unique aggressive multi-mode filter , it can do sharper tones as well.The LFO and envelope can modulate the filter both normally and inverted.The oscillators are digital and so very stable , there is also noise, and the envelopes can self-trigger , which is excellent for generating evolving sounds and effects. The WASP can create a wide variety of analogue sounds , and even has a built in speaker , which can be mic-ed up for effect.It also has a standard 1/4 jack output , and a digital interface which can hook up to a computer or midi convertor or the Spider and other WASPs or GNATs . 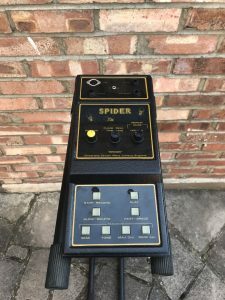 The Spider is sold as seen – I do not know wether it works as it doesn’t have the digital lead.If it does work , it can also interface with CV/gate equipment as well as the WASP. Some controls on the wasp need cleaning as they are a bit scratchy , but they are easily cleaned with a suitable spray or some movement.As is typical with most wasps , the case has some very minor damage , but only cosmetic. As working Wasps are getting harder to find this is a rare chance to get one with a good keyboard and a Spider.” Auction ended. Click here to browse on eBay. “256-step sequencer used with EDP Gnat and Wasp. Has link to Gnat and Wasp (cable not included); also CV/gate to control other analog synths. We believe this to be working. It is however somewhat dingy cosmetically. It also is missing two contact buttons as depicted (although the controls work). We no longer have a Gnat or Wasp to test this with. We therefore sell it “as is.”” Auction ended. Click here to browse on eBay.